Forrest C. of New Mexico! We did a blind drawing the other day. Thanks to all who participated in the blog giveaway, and especially for sharing your stories of food & family, friends & memories. You can read some of those here – recollections of canning tomatoes and picking olives, Christmas dinner and Vietnamese hot sauce, and the connections we make between cooking, family, friends and love. On this New Year’s Day, I wish everyone happiness, good health, zest for life and living, unending inspiration and the means to enjoy it all. May we always have enough to eat, of the foods we love, but not so much that we forget gratitude. Happy 2016! And thank you for coming here. By the way, the drink above is not a New Year’s cocktail. It’s an energizing juice we drink regularly in this house, inspired by our many travels through countries where food is inherently recognized for its healing powers. This is the drink that frequently starts our day, and it’s the drink we take in extra quantities if ever we feel the slightest bit off-kilter (or when we know we’ve been exposed to coughing, sneezing, shivering human beings). Maybe it’s just the drink you want on this New Year’s Day? (Feeling a little hung over?) Fresh lemon, ginger, turmeric, pepper and a touch of honey—that’s it. 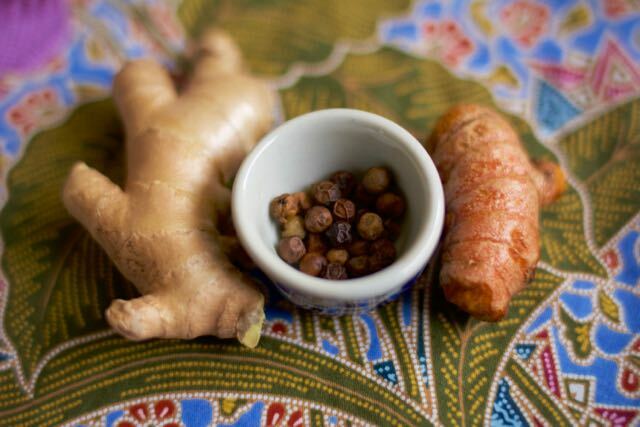 Cultures across the globe have long consumed ginger and turmeric not only for their color and flavor, but their antioxidant and illness-fighting properties too. Western researchers are only just beginning to study the science of eating practices that date back thousands of years. Studies show that it’s actually rather difficult for the body to take advantage of turmeric’s health benefits when eaten alone because it is quickly metabolized in the liver and intestinal wall. BUT combining turmeric with piperine (peppercorns) enhances our ability to absorb the medicinal benefits of curcumin (the key component of turmeric). So this is what we do for the juice: peel then dice or smash a little ginger and turmeric (an inch or so of each, enough for two 8-ounce glasses). If you don’t have fresh turmeric, powdered is fine. 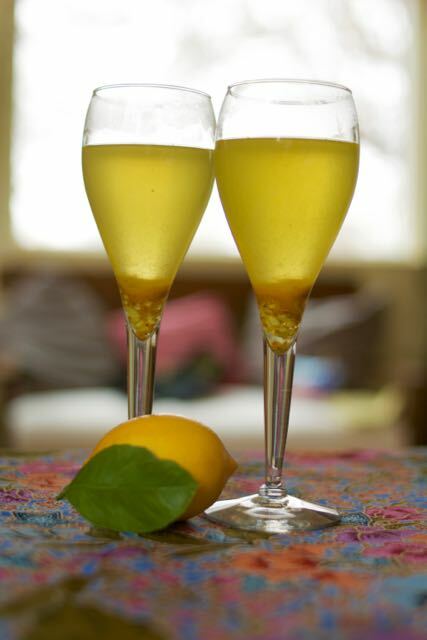 Divide the ginger and turmeric between two glasses, squeeze a quarter lemon into each glass, then add several good cranks of the pepper grinder to each. (This morning we used Kampot red pepper, a fairly rare variety that results when berries are left to turn red on the vine before they are picked and sun-dried). Add hot boiling water to fill the glass. Drizzle with honey and drink. People want to help. Always. This is the message we get every time we return from a trip overseas: people sincerely care, they want to help, they want to make a difference, but they don’t know where to begin. 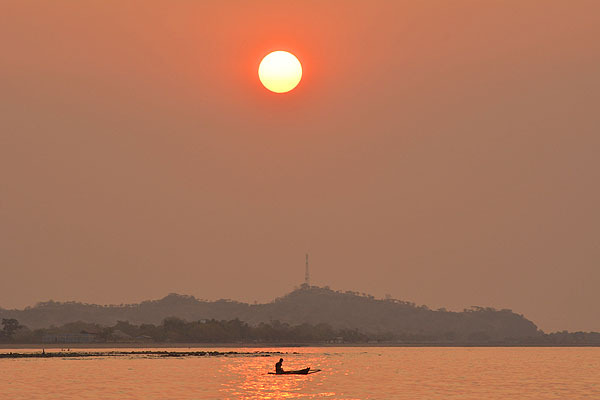 The setting sun in Oecusse, East Timor. 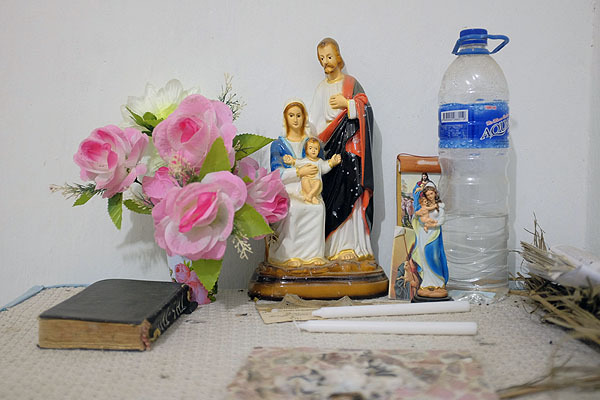 Offerings at a home altar in Aileu. Bairo Pite Clinic (public healthcare, women’s health). Dr. Daniel Murphy, an Iowa native, has dedicated his services—for free—to the Timorese people since 1999. In that time, the clinic has grown to include daily consultations for hundreds of patients (“Dr. Dan,” as he is known to thousands around the country, sees about 200 a day; nearly 1.1 million people in the past 16 years), 55 in-patient beds, a malnutrition program, tuberculosis ward, grassroots training programs for rural birth assistants, TB outreach services, and much more. The toughest part about budgeting, Dr. Dan says, is covering the costs of daily survival—electricity, supplies, staff salaries and all the little expenses that add up to the full cost of keeping a health clinic afloat. Every dollar helps. Give here. 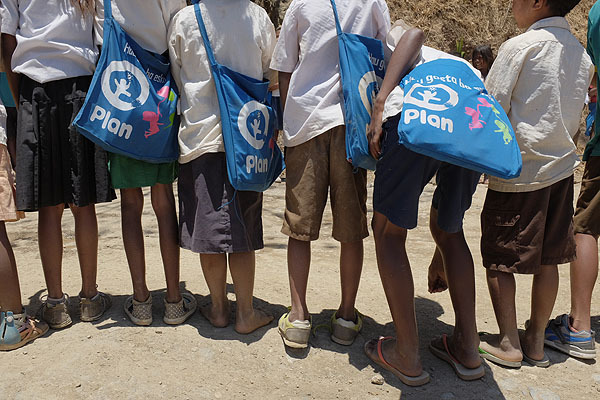 Plan International (education, women’s leadership, early child development). We’ve seen Plan at work in other countries. This is a group that’s all about boosting a child’s opportunities in life… and that covers a lot of ground. We visited a Plan project that focuses on early education through playgroups in rural schools. We also interviewed several women involved in a program to put more Timorese women into elected positions—at the local level (just 2 percent of local leaders right now are women). Give here. Kids from a PLAN school program line up to see the Prime Minister in Aileu. WithOneSeed (environment, sustainability, agriculture, education). This is just one piece of a multi-faceted program based on a simple idea: planting trees and planting ideas. WithOneSeed helps subsistence farmers plant new trees on deforested land, paying each farmer a carbon offset price per living tree. More than 40,000 trees have been planted so far. Meanwhile, partner organization WithOneBean creates a stable, fair-trade market for local subsistence coffee growers. WithOnePlanet is the education arm of the whole shebang, teaching communities across Timor Leste and Australia about climate change and the environmental challenges of the future. Give here. HIAM Health (malnutrition, food security, child and maternal health). 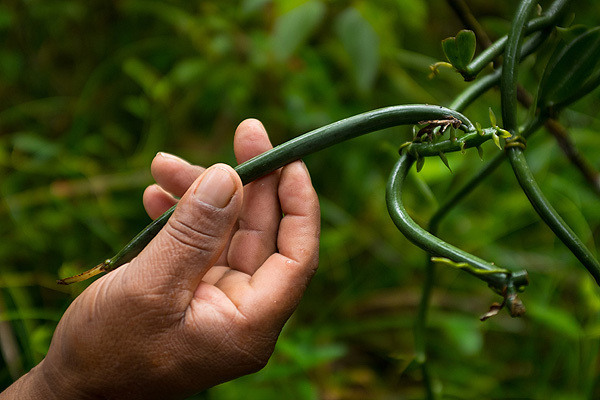 This much-needed local NGO tackles hunger and malnutrition in the garden. It aims to educate families about nutrition, giving them the tools to grow their own food for a balanced diet. 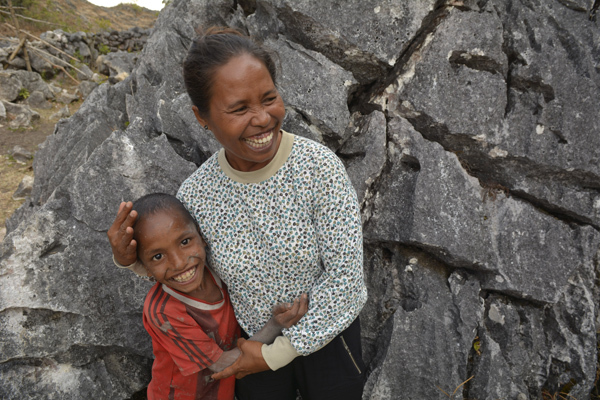 Today, many Timorese families do not lack food—but they do lack the knowledge or cultural resources for families to eat healthy, nutritious meals. Rice is often widely available, and many families fill up on this one starchy grain. Missing are the diversity of key nutrients needed for long-term health. Give here. Mercy Corps (food security, sustainable agriculture, environment, economic development). This is another group that wears many hats, working in rural communities (where 80 percent of the population relies on subsistence agriculture). MercyCorps not only helps farmers with improved techniques and storage, for example, but also works on the economic side of things—savings and loan programs, access to markets, jobs. Here’s something I really like about this group: Country Director Joanna Walshe has a background in anthropology. That means she looks carefully at the cultural reasons why a program does or does not work. Is the fish pond too far from the house? Do women have enough say in the family or village to make critical program decisions? What are the real barriers to a healthy diet? These are the complex sorts of questions Walshe is constantly asking. Give here. SportImpact (sports, human development). This group runs athletic workshops in rural areas, encouraging Timorese people in the farthest reaches of the country to organize their own sporting events and make their own equipment using local materials (water bottles, cardboard, wood, scraps). Not only do these programs promote health through activity, but they build confidence and inspire young Timorese to create the future they want—without waiting for the government or an NGO to do it. This is a key concept that would be useful in many post-conflict countries, where the long-time presence of aid can create a dependency syndrome. Seeds of Life (agriculture, sustainability, environment, economic development). Working within the Ministry of Agriculture and Fisheries, this initiative helps local farmer co-ops build a national seed production system that will supply farmers across the country long into the future. These seeds are open-pollinated and naturally selected high-quality, high-yielding varieties (no GMOs) of rice, maize, peanuts, cassava and sweet potato that were bred specifically to deal with local conditions in a changing climate. 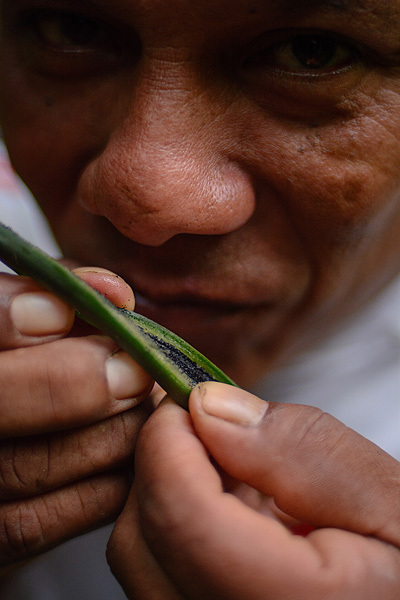 And they taste good, too—that’s key to making these crops succeed. In the past, the government had to import hundreds of tons of seeds each year just to meet farmer demands. This program aims to end that, replacing imports with biologically diverse and locally grown varieties. Seeds of Life also works on improved storage techniques. 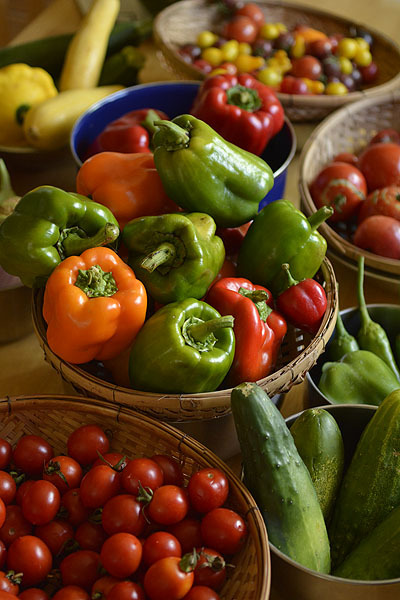 The initiative’s slogan: “Food security begins with seed security.” Get in touch here. Bags of Seeds of Life maize at a farmers’ co-op in a village in Liquica. Marie Stopes (women’s health, sexual and reproductive health). Statistics have improved greatly since independence, but East Timor still faces some of the world’s greatest challenges in infant and maternal mortality. Many rural residents walk hours to the nearest clinic. Women have on average six children in a lifetime, but many have no access to doctors or midwives. Contraception can be hard to find. Marie Stopes aims to fill this gap, working with the Ministry of Health to ensure all women have the reproductive services they need. Give here. World Neighbors (water and sanitation, agriculture, food security, health and more). This Oklahoma-based organization works in the remote enclave of Oecusse, a hard-to-reach district surrounded by Indonesia and the sea. There is no regular flight service. Getting to Oecusse from the rest of East Timor requires a (fairly expensive by local standards) 4-hour fast ferry ride, a grueling overnight ferry (which locals and foreigners alike told us never ever to do) or a drive through Indonesia. And Oecusse itself is largely cut off from… everything. Aside from the main town along the coast, almost no roads exist throughout the district (or the roads are so bad that no one drives them). Locals walk hours up and down the mountains—for health care, supplies, jobs, and anything else that people need. Give here. ETAN (human rights, democracy, news). The East Timor and Indonesia Action Network promotes human rights, justice and independence for Timorese people. It also maintains a thorough email news list, providing subscribers with information on East Timor, Australia and the region that otherwise can’t be found easily. Give here. Our reporting from East Timor was supported by a fellowship through the International Reporting Project (IRP). 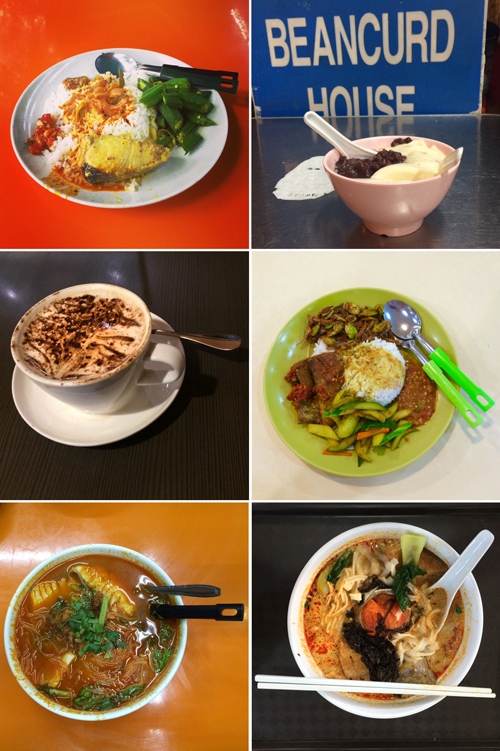 Just a few of the many flavors and histories of Singapore: (clockwise from top left) curried fish, Chinese bean curd, Malaysian curry plate, laksa, sour fish tom yam soup, coffee. When I learned of the blasts in Beirut, I was in transit from Singapore to Dallas, and I caught blips of the story at airport stops along the way. When I heard about Paris, I was home. I was driving around Albuquerque in a jetlagged fog, angling between Trader Joe’s and Whole Foods, aiming to restock the fridge after six weeks away. I was thinking about the remainder of my shopping list—cilantro, ginger, dish soap—as NPR aired the shocked and somber voices of those on the ground. Just the day before, Jerry and I had left our hotel in Singapore and taxied through a neighborhood predominated by Muslims and Chinese. Next door was a popular 24-hour food court where we ate a handful of meals the previous week. Customers gathered all hours of the day and night, drinking sweet tea and chatting across bright orange tables bordering a busy street. Worlds and cultures converged on that corner, united by food. Side-by-side vendors sold Chinese fish noodle soup, laksa, mee goring and nasi campur. Women in headscarves ate among others in shorts. That food court was a lesson in tolerance, and so was the clientele. Looking back now, just a few days later, it is eerie to recall the conversations Jerry and I shared in Singapore about the level of deference that city upholds. Singapore: a hub of capitalistic consumerism, born of ethnic mix and a history riddled with violence. Diversity isn’t a mere aspiration or meme in Singapore, it’s the core of national identity. 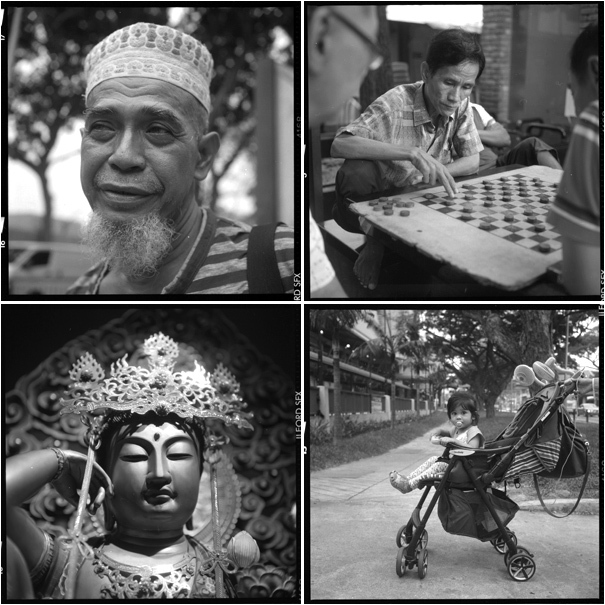 (The people are predominantly Chinese with substantial populations of Malays, Indians and Eurasians.) Sitting strategically at the southern tip of the Malay Peninsula, this island has long drawn from from cultures across the globe. Through the centuries, it shifted hands among early kings, British colonizers and Japanese forces. For a short time, it was part of Malaysia before separating in 1965, following race riots and crippling political strife. Peace and stability came with high prices. Founding father Lee Kuan Yew, who governed from 1959 until 1990, aimed for economic progress combined with multicultural co-existence. But he was roundly denounced for his policies suppressing free speech and political opposition. Lee, who died earlier this year at the age of 91, was a dominant force; he saw no other way toward economic prosperity and peaceful co-habitation of the island’s disparate groups. Day to day, on Singapore’s sidewalks, in its offices and shops, there is a palpable respect for others. Restaurant windows post notices: “No pork, no lard.” Street signs are written in English, Mandarin, Malay and Tamil. These accommodations reflect an understanding of diverse needs and views. More importantly, they reflect a willingness to accept the differences that make Singapore what it is. Many argue the country’s policies don’t go far enough. Some debate whether the city is “truly multicultural” or simply tolerant of multiple races and ethnicities. Regardless, it’s a start. In an age when the twin fears of terrorism and immigration trigger intolerance worldwide, we could all use a little more acceptance, a lot less condemnation. We could all strive for peaceful co-habitation. The day after leaving Singapore, I sat in a Whole Foods parking lot checking my phone. I read the first message from a Facebook friend in France. “What happened today in Paris is a horror, but we are safe….” As I drove south toward home, the horizon turned a brilliant scarlet as the mountains painted deep, dark silhouettes against a starry sky. I listened to more NPR. It was, of course, the biggest story of the day, and again the next. And then a backlash began with social media critiques on personal grief. Let us not forget other victims in under-covered places, many implored; let us not diminish the agony of Paris, others insisted. We are all just trying to relate. As human beings, that is what we do. That is how we form our understanding of the world. For the millions of us lucky to have escaped terrorism in our homes and in our own little circles, we empathize through the experience of others. We feel through the small connections we can make with people and places we know. This is how we grasp for comprehension. This is where the inspiration to make a better world begins. Now, this month of November marks 500 years since the Portuguese landed on Timor Island and established a colony on the eastern end of the Indonesian archipelago, a region rich with oil and timber. The Portuguese kept their hold on Timor until 1975 following a coup in Lisbon. Nine days after Timorese revolutionary leaders declared independence from Portugal, Indonesia invaded with an OK from US President Gerald Ford and Secretary of State Henry Kissinger. This was right after the Vietnam War. It was a time when the fear of communism dictated geopolitical maneuvers, and the prospects of natural resources shaped international policy—as they do today. For 24 years, the Timorese people lived under a brutal occupation, which led to the deaths of some 200,000 people—a third of the population back then. In the early years, Indonesian forces bombed the interior of the island from land, sea and air. Thousands of civilians fled their villages to the mountains, where they camped in caves. Mana Leo atop the mountain where she and her family hid during the Indonesian years. She is hugging Paul, a local village kid who admires her greatly. Mana Leo, a principal, encourages Paul to stay in school. Just a couple of weeks ago, just a couple of weeks before Beirut and Paris and Nigeria and Mali, I hiked through with a lovely woman named Leopoldina Guterres, known as “Mana Leo.” We climbed a steep mountain where she and her family hid during the raids. She was 7 years old when the terror began. She carried her newborn sister at her hip while her mother searched for food. For years, Mana Leo and her family, like many, ate whatever they could find: wild beans, dried potatoes, roots and tubers. Indonesians shot thousands of Timorese. Many more died of starvation and thirst. Small graveyards are scattered across the mountain today—red crosses mark those who died fighting; white crosses denote many more who died of disease and hunger. “Sometimes seven, eight people in one family died,” Mana Leo told me. Sometimes children and parents died on the same day. There wasn’t time or means to bury them all. These are the memories that shaped Mana Leo’s childhood, and these are the memories she still carries today. From Timor to Paris, Beirut to Kenya, Syria to Iraq and far beyond, millions of memories are imprinted in bloodstained shirts and the blistered feet of treacherous marches toward freedom and peace. Jerry and I spent four weeks crisscrossing Timor-Leste to report on health and development. We heard stories like Mana Leo’s again and again. In 1999, the Timorese people were granted the right to vote in a referendum, and they overwhelmingly chose independence. Indonesian-backed militias retaliated in a rampage of rapes, massacres and fires that destroyed much of the country. The UN intervened, and Timor-Leste became fully independent in 2002. Thirteen years later, we find a hospitable, tolerant, forgiving, energetic population set on a better future despite the scars of its past. I thought of Mana Leo last week in Singapore, as I threaded my way through a society evolved from its own historical scars. And I have thought of Mana Leo every day since the Beirut and Paris attacks. Forty years later, the memory of terror still brings tears to Mana Leo’s eyes, but she is alive. In fact, she is more alive than ever. She is a grade school principal, the manager of a reforestation project and the mother of a house that feeds and shelters 20 neighbors and relatives entrusted to her care. Mana Leo can never bring back the dead. But she can make her world a better place than the departed ever had a chance to see. Surviving the past has given Mana Leo an unbridled will to live in peace. And that will for peace may well be the final triumph over terror. Reporting from Timor-Leste was supported by a fellowship through the International Reporting Project (IRP). Jerry and I lived for several years in Roseburg. He worked at the local paper, The News-Review, while I went to graduate school up the road in Eugene. It’s sickening to hear what happened yesterday. That is not the Roseburg I knew. We spent our weekends outdoors, as often as possible. We hiked the 79-mile North Umpqua Trail, through old-growth forests and alongside waters where steelhead spawn. We reported and photographed that trek for a five-part series that ran in The News-Review. I grew my first herb garden on a tiny patch of dirt along the side of our rental house on a steep hill. We used to walk down that hill all the time, toward McMenamin’s Roseburg Station, meeting good friends for beers. On sunny days, we’d sit outside on the patio, grateful for clear skies. I trained for two marathons in Roseburg, running long miles into the countryside, often in a drizzle. But the air smelled so fresh, so green, in way that happens only in forests. Then I’d get home and jump in the hot shower and relieve myself from the chill. Jerry and I married on a ranch on a river in the hills nearby. Guests stayed in cabins, and we danced until late at night. We had kegs of Red Hook and local wine. We roasted a pig and told the caterers what we wanted them to make: corn, beans, olive salsa and so much more. We ordered nine different cakes from a local bakery called Tomaselli’s. Umpqua Community College gave me my first teaching jobs. I spent part of a summer helping kids create their own newspaper, and later in the year, I taught Southeast Asian cooking classes to adults. I remember spending hours in the area’s Asian groceries, searching for the obscure ingredients I needed; then more hours in the kitchen prepping dishes. I wasn’t paid for all those hours, but I did it because I wanted to share what I knew—and the class greeted me each week with so much enthusiasm. I miss those days. I miss having all those hours to cook for people who were so interested. One of the recipes I taught was tapioca. Many people don’t like tapioca, or they think they don’t like tapioca. But this one has coconut milk and mint, and sometimes fruit. It’s mild and gentle, calm and cool. Several months back, here in New Mexico, I took it to a Sunday brunch—a regular get-together started by an exceptionally generous host who opens his doors once a month to crowds of people. We eat salmon, drink coffee and talk. The tapioca was a hit, shared with strangers, and it was the impetus for new conversation. And it makes me think: what a way to symbolize peace. I posted the recipe a few years ago, and I’m going to offer it again today. It’s simple but rich, a little bit sweet and full of comfort. And sometimes that’s just the thing we all need. Rinse the tapioca pearls under cold water and drain well. Pour into a saucepan with water, sugar and salt, and bring to a boil. Stir constantly (the tapioca burns easily on the bottom of the pan) and cook until tapioca pearls turn translucent. I have found the cooking time varies dramatically depending on the type and size of tapioca as well as altitude. You’ll know it’s done when the liquid is absorbed and the tapioca has become gelatinous while still maintaining some of the pearls’ shape. Taste, remove from heat and stir in coconut milk. Let cool until the mixture is firm. 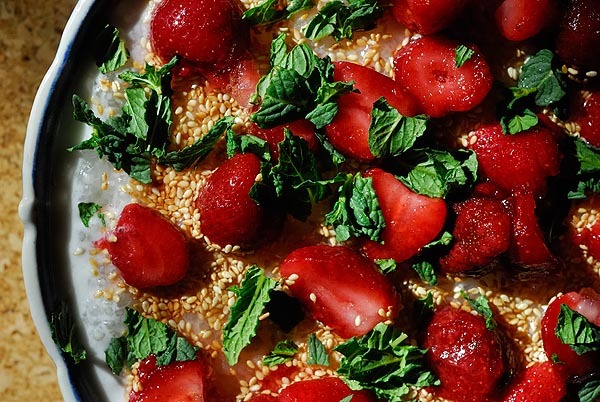 Top with fruit, mint and sesame seeds. Serve chilled or at room temperature. Welcome! If you’re just coming aboard now, I’ve been doing a three-part series on end-of-summer harvest recipes. This is the third installment, and perhaps the easiest. But it’s my annual staple. It’s the one item I aim to make every late summer because, come January, nothing rivals the summery freshness locked into a simple garden harvest sauce. We planted six or seven varieties of tomatoes this summer in all shapes, colors and sizes. They’re still coming. Some are super-sweet, others are prettier than they are flavorful. I took a big bowl of them all (my bad: I didn’t measure; probably, roughly, 16 cups?). 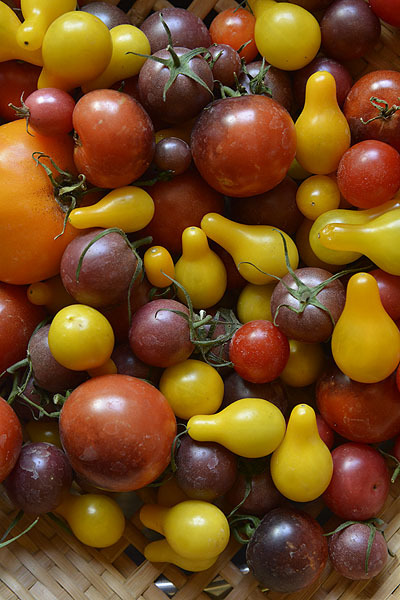 The point is: you want as many summer sweet tomatoes as you can find. More will never hurt you, in this recipe. 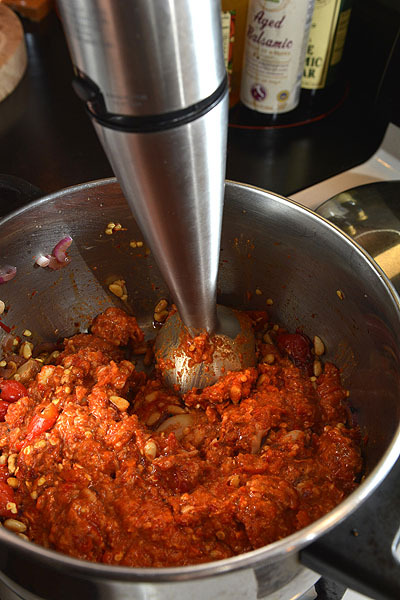 Now, before we begin, remember two things about this sauce: 1) It’s quick and easy to make, and that’s the key. This isn’t your simmer-for-hours sauce that eats into your entire weekend. This is your get-those-tomatoes-processed-now sauce, which still tastes great whenever you open the jar. 2) This is not meant to be a thick, hearty spaghetti-style sauce. 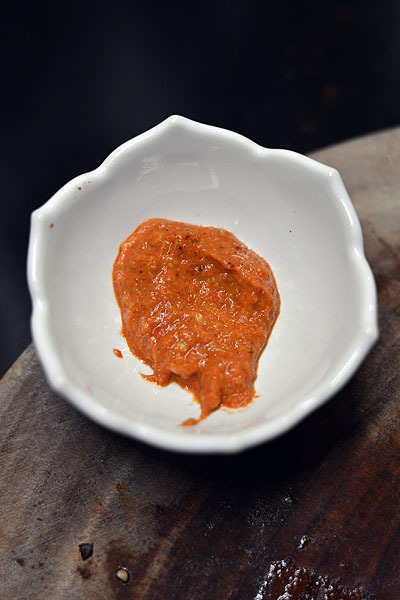 This is a BASE sauce aimed at bringing summer flavor to your winter meals. 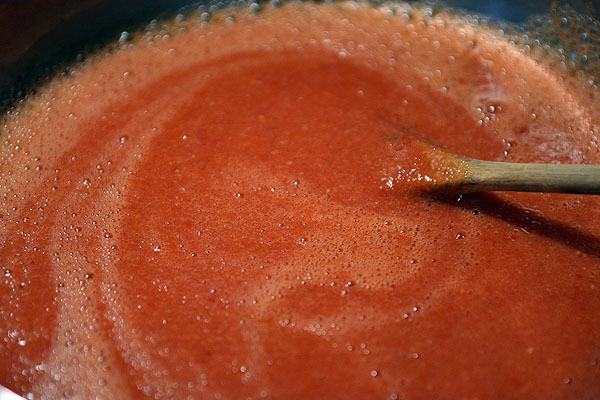 Use it in tomato-based soups, stews, pasta dishes or whatever you want. It will be thin in consistency, but big in flavor. 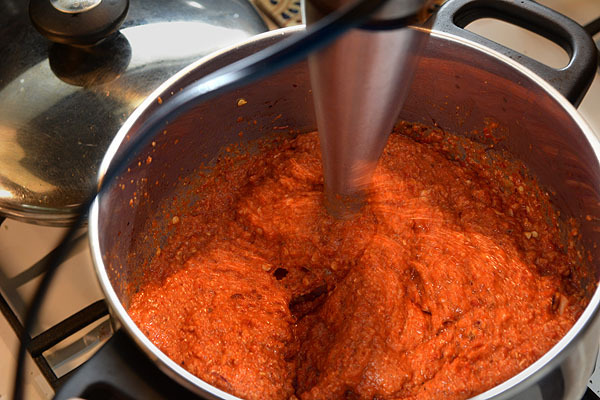 Take all your cleaned tomatoes and put them in a food processor. Purée. Set aside. Heat a little olive oil in a saucepan and sauté a thinly sliced red onion (or 2 or 3, depending on size and the number of tomatoes you have and your liking of onion). When the onion is nicely browned but not burnt or bitter, add a few minced garlic cloves. Stir and remove soon from the heat. Do not burn the garlic or it will turn bitter. You want no bitterness in this sauce. Mix together the tomatoes, garlic and onion. Add salt, pepper and a drizzle of olive oil. 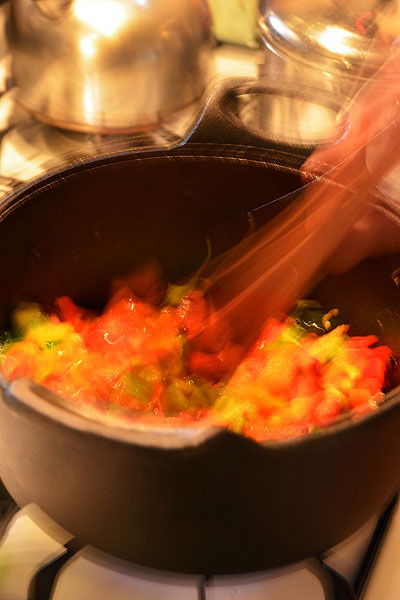 Heat on the stovetop until the sauce just begins to simmer for a minute or two at most. Control the heat. Remove. That’s it. Use immediately, freeze or can. If you choose the latter, try this in winter when all thoughts of summer are far away. As I said, the sauce will be thin; mix with whatever other ingredients you prefer. But the tomato-ey flavor should take you right back to the garden in September. I LOVE sweet peppers. We have a variety of hot things growing in our garden right now, and a few small sweet items as well. 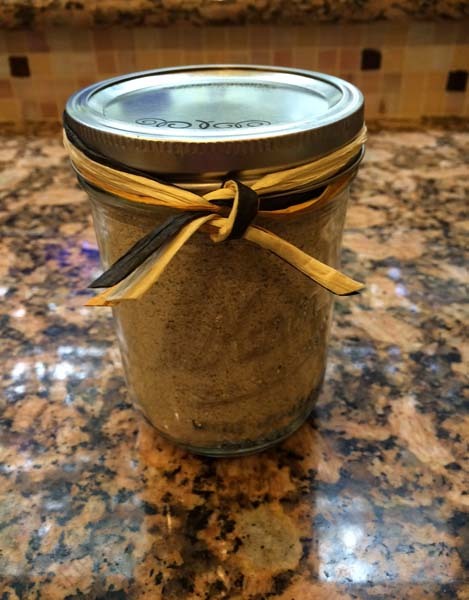 But I wanted more—enough to make a healthy batch of this rich pepper spread. So I visited Old Town Farm in Albuquerque where customers pick their own. Rows and rows of peppers—and grasshoppers eager to beat you to the goods. Get in there soon! Rinse the peppers and place them on a hot grill along with the whole head of garlic. 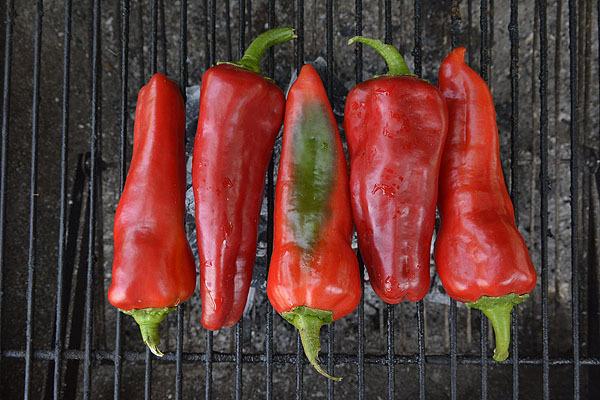 You want to char the peppers so the flesh inside turns tender and juicy. 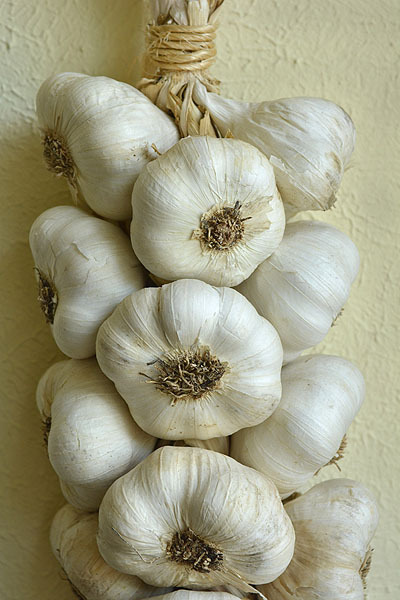 Grill the garlic until the skin is charred and crispy and the cloves are softened but not burnt. 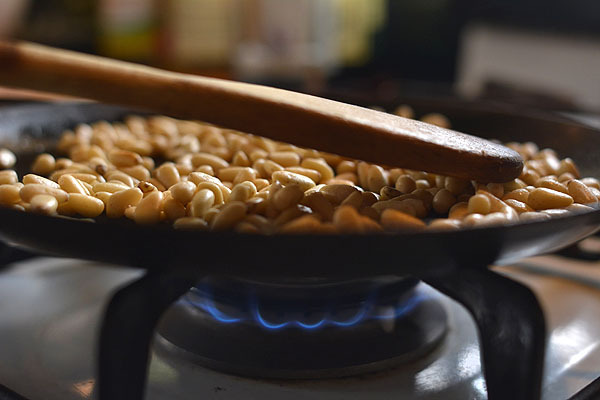 Meanwhile, sauté the pine nuts on the stovetop, stirring constantly. You want them nicely golden, not burnt, not bitter. Quickly remove from heat as soon as they start to brown. Next, sauté the onion in a bit of oil until it is nicely softened. Set aside. 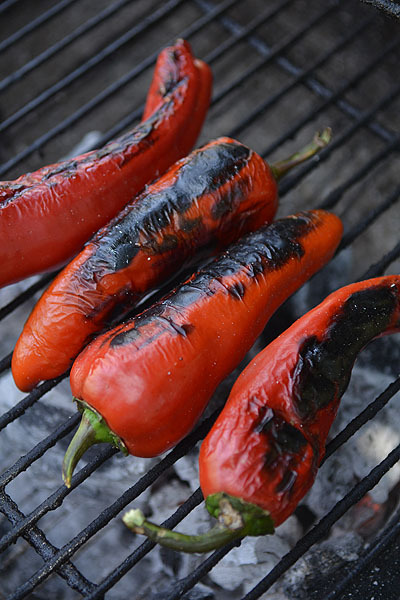 Remove the garlic and peppers from the grill when finished. 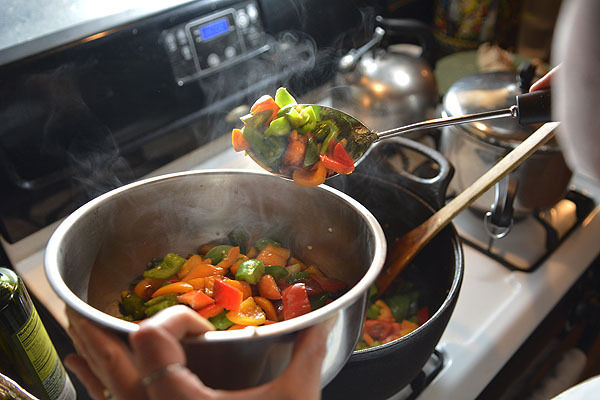 Allow the peppers to cool, then remove the skins (which should slide off relatively easily). Remove stems (and seeds if you desire), and chop peppers roughly. Place into a bowl or food processor along with 3-4 of the roasted garlic cloves (more if the head is small) and the onion. Add the toasted pine nuts. Purée until creamy. Add salt, pepper and paprika to taste. Serve with crackers, vegetables or anything you desire. Time—it’s fleeing! And I can’t catch it. When we’re young, the world is new and every minute is filled with the possibility of a whole new landscape that we can map and create in our minds. We’re just beginning to sort it all out. The more we focus on the “new,” the slower we perceive time to be. Remember how summer lasted forever when we were kids? To a healthy child, every moment of every day brings yet another way to experience the world. The same happens when we travel, I think—and that’s a big part of the appeal to me. I can spend a week at home, plodding through mundane tasks (transcribing notes?!? ever tried it?!? ugh) and time passes into obscurity. A week later, I barely recall what I did or ate or saw in the hours before. A week of nothing much new feels seven times faster than a week on the road or in the field where I’m learning new things every step of the way. Routine seems to speed up our perception of time. How to slow it down? Experts say do new things, see new sights, bring newness into your world—every day. I think that’s what most of us want: to savor our moments. To preserve the time we have. To make it count. It occurred to me: that’s not so different from the hopes we have for our gardens. The seasons are changing, geese are honking overhead. It is time to harvest, to put our summer yields into pots and pans, jars and bins. This is a reward: the ability to stop time in its tracks. To capture the sweetness of a summer tomato or the freshness of bell pepper by cooking it into a sauce and preserving it for future times—colder, darker times when summer light is long gone, and so is its flavor. But then, we can pull that jar from the freezer and taste the fruits of an earlier time. 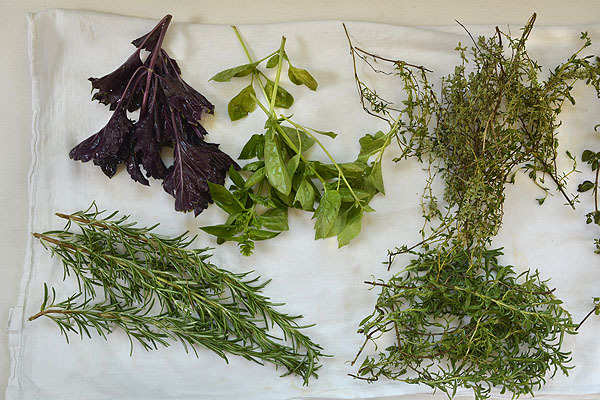 Here, I’ll offer up three garden harvest recipes in a three-part series. Today: ratatouille. Next week: sweet pepper-pine nut spread. 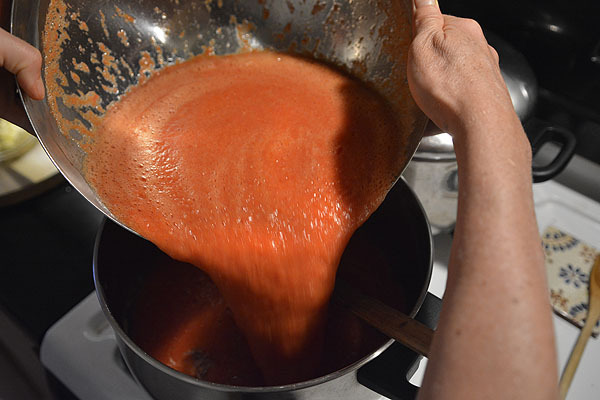 And finally: simple tomato sauce. Now, I make no claims to French authenticity in this recipe—but I’ve tested it on friends with French roots, and ooh la la, this dish pleased. And anyway, I’m not so much about authenticity as I am about whatever works. A couple of keys, I’ve found: recipes vary tremendously on the suggested herbs. Some merely call for a bit of oregano or basil. But I’ve been using a hearty mixture based on this recipe. 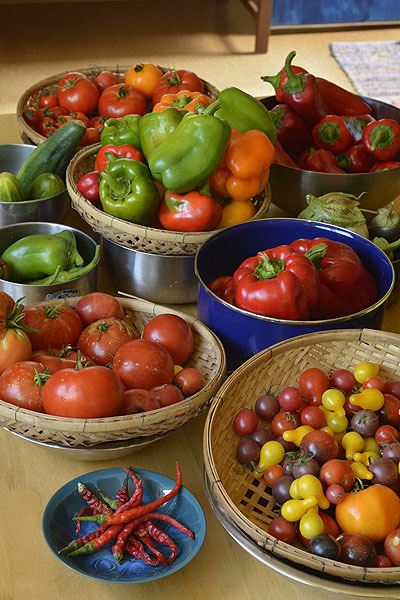 And I’ve been using fresh from the garden—because it’s here, it’s abundant, and why not? The herbs make this dish what it is. Also: this is a use-what-you-have recipe, so there are no hard-and-fast rules about amounts. You might have one eggplant or you might have 3. You might have a pound of tomatoes, or six. Below are the amounts I used most recently. 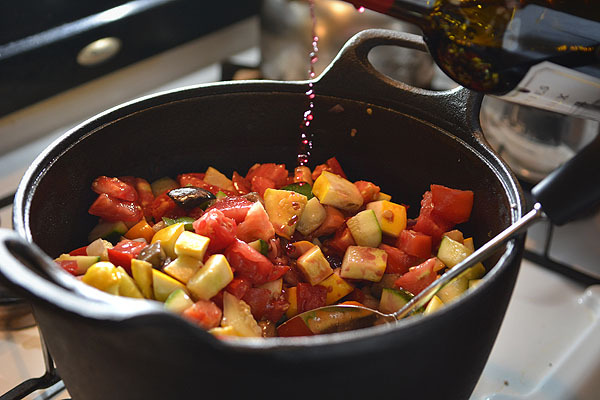 Key to ratatouille is sautéing each vegetable separately before combining and cooking in the oven. 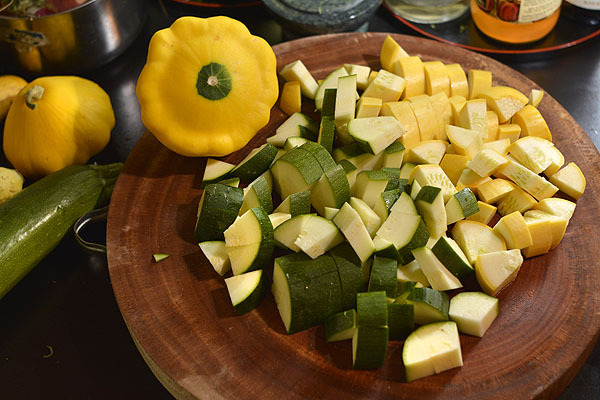 First, prepare each vegetable by chopping into small cubes or slices. Heat a bit of the olive oil and sauté the onions until slightly browned. Remove. 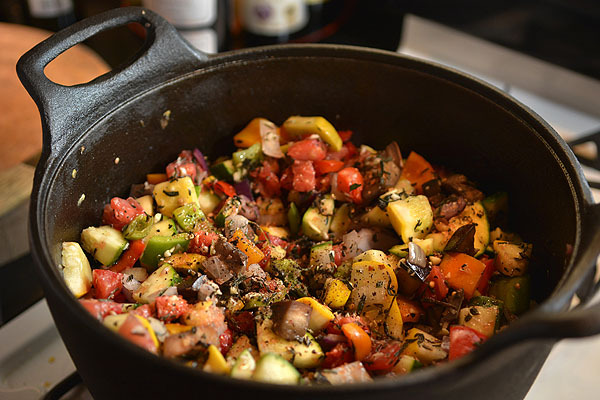 Add more oil to the pan and repeat the above step separately for each remaining vegetable—peppers, eggplant, squash—except the tomatoes. Leave those for later. Heat the oven to 350 Fahrenheit. Meanwhile, prepare the herb mixture. Place all of the herbs along with salt and fennel into a food processor (or mince with a knife) until you have a fine, aromatic mixture. Pour all of the cooked vegetables into an oven-safe dish (I used a cast iron Dutch oven), add a glug of oil, a few glugs of red wine. Stir well. Add the herb mixture and stir. Add the garlic, tomatoes, salt and pepper. Stir. If the vegetables are very dry, add just a tiny bit of water. Cover and bake in the oven for 1 hour. Taste. The flavors should blend well, and the juices should not be too runny. If you want a creamier texture, add a bit of butter and enjoy. 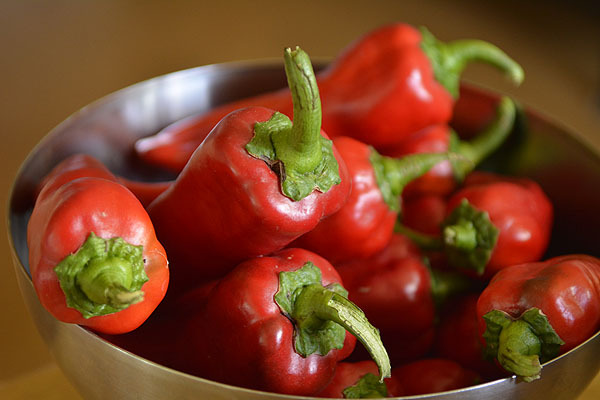 Stay tuned for next week: sweet red pepper-pine nut sauce. 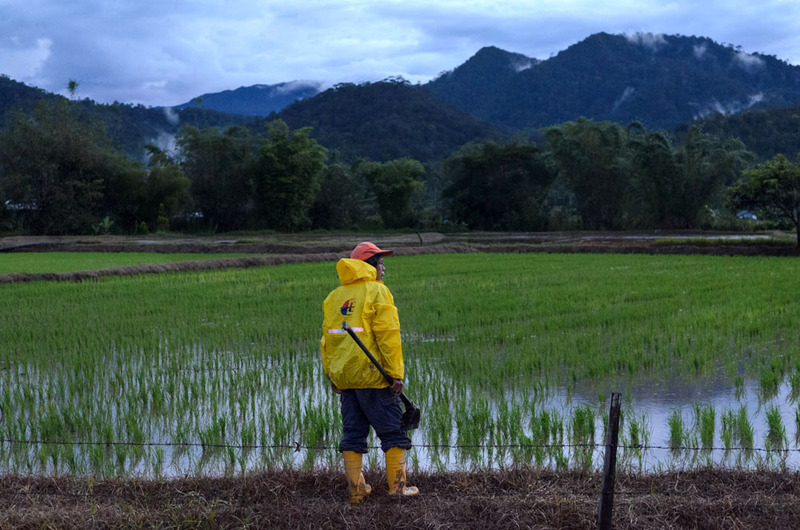 A farmer looks at his rice fields at dusk in the Kelabit Highlands of Malaysia. A logging road has brought many changes to the Kelabit people of the interior highlands of Borneo. One of the biggest shifts is mechanized rice growing, which is changing how the grain has been grown for generations. The first time we traveled to Bario, there were no roads in or out. We flew into this remote little outpost in the Kelabit Highlands of Malaysian Borneo. The only other option at that time (2006) was a terribly long trek (weeks) through the mountains over difficult, possibly dangerous terrain. Things change. There is a logging road now (although airplane is still a common mode of transportation). There are cell phones. There are trucks in Bario town. And now, for the first time in the history of the Kelabit people, there are machines for farming rice. I recently wrote about this shift for the NPR site, The Salt. Here, I wanted to share a few more images (they’re Jerry’s) and insights into the story of this one little community’s tilt toward modernization—and what it means. 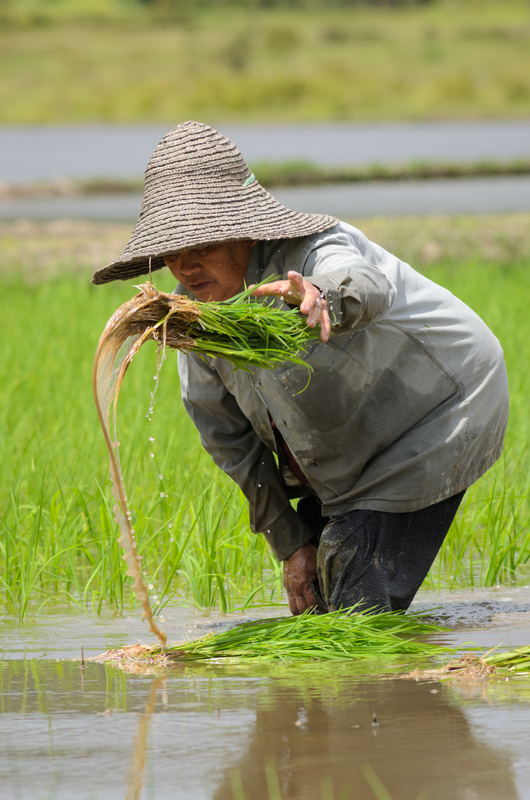 A woman replants paddy rice by hand in Bario. This is a region where locals have always farmed, foraged, hunted and/or fished their own food. 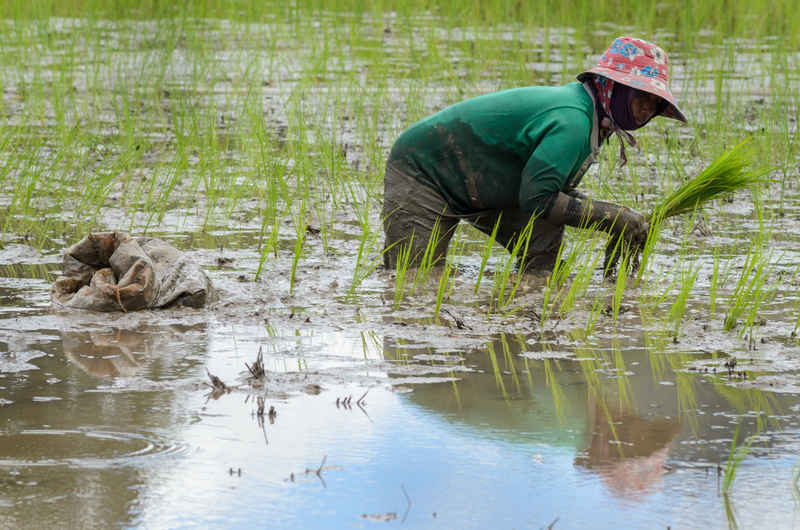 The Kelabits, longtime rice-growers, have always planted and harvested by hand. Their rice, a medium-grain variety noted for its sweetness, has a reputation among connoisseurs: it’s good, darn good. So good, the Italy-based Slow Food Foundation supported it through its Presidia program for several years. And then things started to change. (Actually, they’ve been changing for a long while.) Farmers are abandoning their fields. 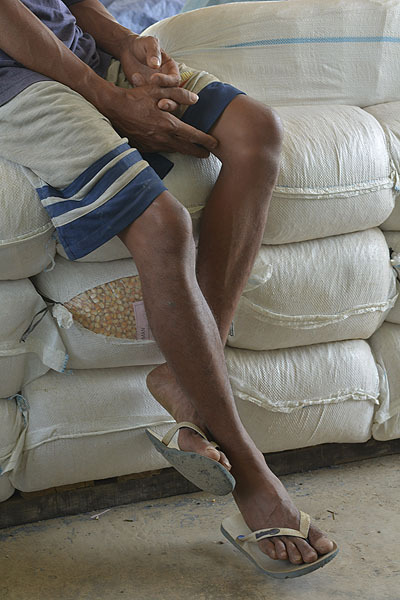 Villagers are buying more imported rice. Others are farming with chemicals, as they never used to do. In 2011, Bario rice lost its Slow Food designation (although the Foundation still lists it as a noteworthy traditional crop worthy of preservation). Bario—while remote and lovely, filled with birdsong and pure air—has few jobs and little incentive for many youngsters to stay. And so they go—to Miri (on the coast) or Kuala Lumpur or Australia or the United States. Still, many of the elders want to stay. They grew up in the Kelabit Highlands; it’s home. They have no use for city life. So they persist—often alone, into older age, when depression sets in. When the bones start creaking and humidity pains the joints. When the prospects of bending for hours beneath the hot afternoon sun just doesn’t hold much appeal. Then along came a company called Ceria. It’s an agricultural group that struck a deal with the local community and Sarawak state government to bring mechanized rice farming to Bario. Individual villagers have differing arrangements with the company, but in most cases, Ceria does the work and keeps a (significant) percentage of the yield. Meanwhile, the landowner keeps the land and takes the remaining percentage of the yield. 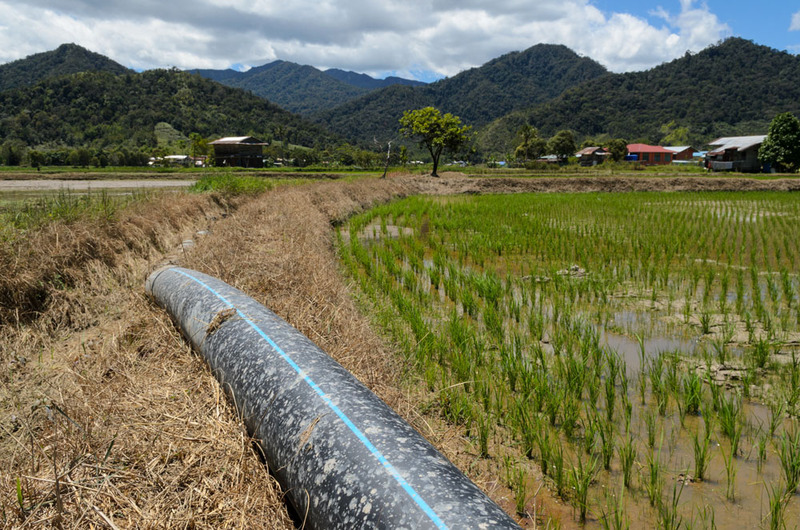 A massive plastic irrigation pipe straddles two rice fields that are worked by Ceria, the company that brought mechanized rice farming to the Kelabit Highlands. They also brought the irrigation infrastructure to increase the yields of the fields they cultivate. It’s a years-long process to make this shift. It means irrigation pipes, heavy machinery, access roads to individual farms and the equipment needed to level and restructure abandoned paddies that had filled with weeds. 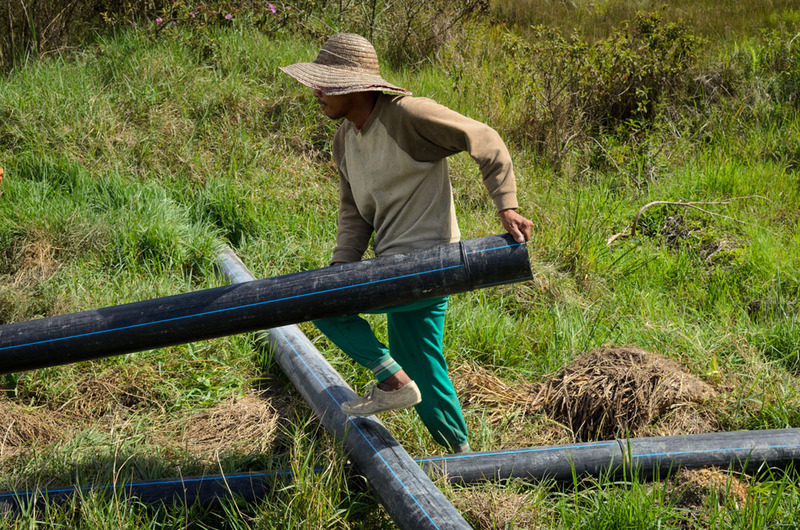 A worker with Ceria handles a length of plastic irrigation pipe in a project to bring irrigation water to distant fields in Bario. Is this good? Is this bad? Do we mourn the loss of traditional hand-planted rice? Or do we celebrate the benefits of technology? There are no easy answers here—there seldom are, when it comes to cultural change. I spoke with several villagers for, and villagers against. I spoke with elders who think the soul of their culture is shifting with this new style of rice. I spoke with other elders who welcome the chance to eat rice grown on their own property—without their own hard labor. 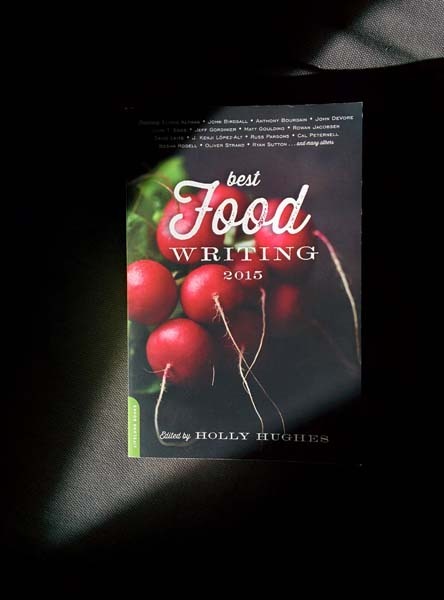 It’s a particularly interesting case, I think, because it shows the complexity of modern-day food movements. As a Westerner with a background of privilege, it’s easy to embrace the buzzwords of these food-minded times: organic, local, artisanal, traditional. These are concepts we aim to bring back to our own food systems here in the United States… right? 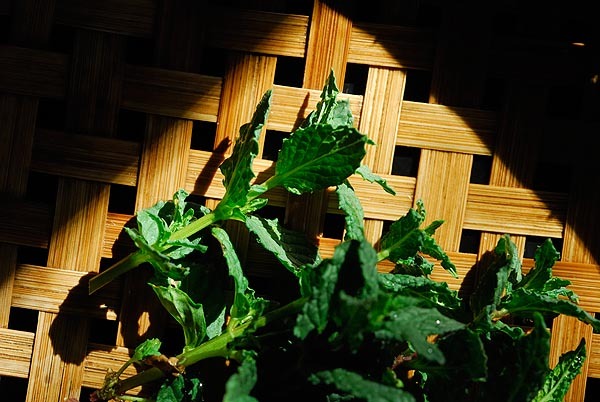 We fight the mechanization that has, along with it, brought disease and antibiotic resistance, soil depletion and superweeds, runoff and contamination. We don’t want others in the world to repeat the mistakes we’ve made… right? What about the widows of Bario who are happy to eat Ceria rice grown (yes, with machines and chemicals) on the land they’ve always known? No easy answers at all. But stories like these continually remind me of that hallmark lesson in anthropology: cultures change. People change. They always have, they always do. We cannot understand changes to our food systems on a global scale without understanding the people who change with them. 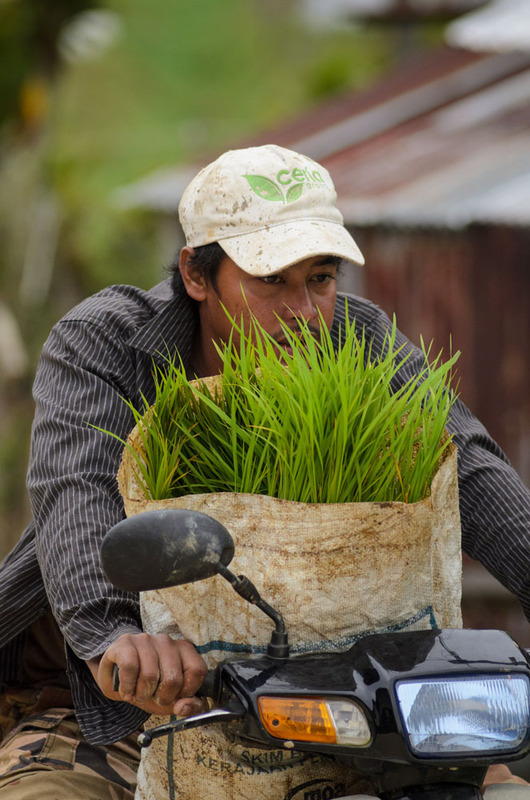 A worker with Ceria carries a bag of paddy rice for transplant in Bario. An outside view of Battambang’s Psar Nath. There are always stories behind stories. When we write an article for publication, there are characters we edit out, anecdotes we omit, details we cut for brevity or clarity. Much is left in the notebook for another day, another place… or never at all and nowhere to be seen. Only a smidgen of all we encounter as writers makes it from notes to narrative. In between is everything else: the getting here and going there; the packing and unpacking, checking in and checking out, waiting for this and that. 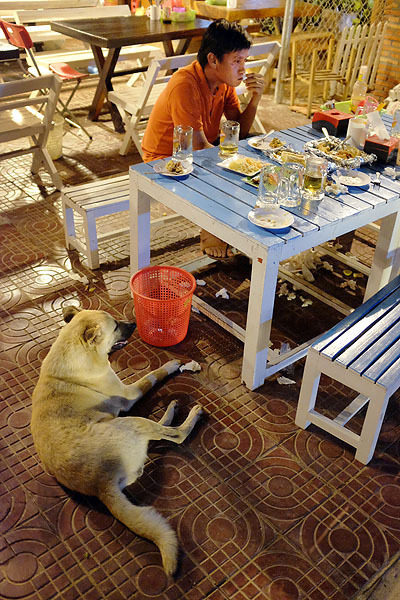 A man, his dinner and a dog at a riverside restaurant in Kampot. On our most recent trip to Cambodia, Jerry and I followed in the footsteps of the 19th century French explorer Henri Mouhot. He is most famous for his visits to the Angkor temples. (And many have erroneously claimed he “discovered” these monuments. Nonsense. Cambodians always knew these temples and never forgot their ancestors who built them.) Mouhot kept detailed diaries of his journeys through Southeast Asia, and his insights still hold weight today. If you’re interested in Mouhot’s adventures through Asia more than 150 years ago, you can follow along in our story this weekend, in The New York Times. But if you want to know about some of the back matter—the in-between—about the food we encountered along the way, keep reading. 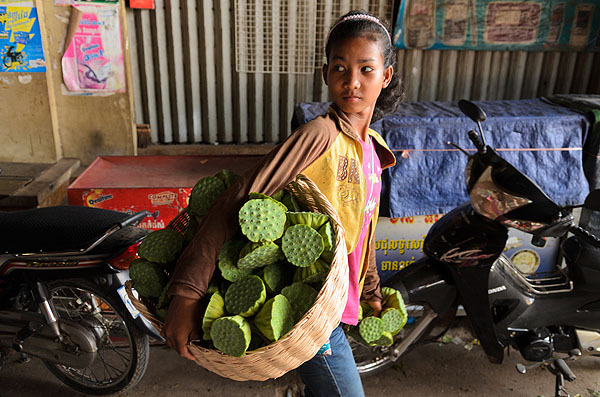 A Cambodian girl sells lotus on the street at a popular Siem Reap breakfast market. The caretaker of Wat Banan, near Battambang, eats lunch with his family. We dine at Cuisine Wat Damnak and each order the 6-course tasting menu labeled #1 But first, we begin with cocktails: a basil mojito and a turmeric iced martini with just a hint of dustiness in the flavor, as well as lemon. I like. The menu is extraordinarily delicious. I love the strong cinnamon flavor combined with peanut in the Mekong langoustine curry (though Jerry is right – it needs salt and I’d say chile). The fish atop dry Vietnamese soup has all the sweet/tart flavors of an actual soup but little liquid. There are cubes of tiny veggies; melon that melts in the mouth with the sopped-up flavor of that liquid-less “soup.” The fish is charred ever so slightly on the outside – perfect. The black sticky rice porridge with rich slices of duck tempered with spring onion: it’s an entrée as heavy as can be in Khmer cuisine. This porridge has acquired a consistency akin to thick gravy. We sit upstairs in the open-air dining room with high ceilings. Downstairs is air-conditioned. We are at first seated in the back corner, beside a closed window. Why? Why do staff ever seat customers in “Siberia” when so many other seats are available? We move to a table near an open window. I later see more open tables in the front room, with much bigger windows and airiness. No one sits there all evening, though the tables are set. At the very end of the meal is a tray of sour, mouth-puckering fruits served with a cocaine line of salt, chile, kaffir lime (or whatever you decide to call it these days) and a bit of sugar (almost imperceptible). What a fabulous idea, what immense flavors – the salt, the chile, the lime pounded so finely together, with just a tiny sweetness. It surprises the tongue. That lime leaf! Volumes of aroma. 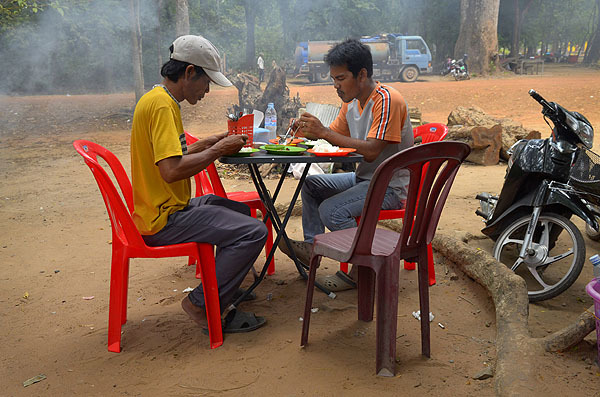 Grilled meat is a popular lunch choice near the Bayon Temple. We tour the Angkor temples, rising early, dodging crowds, climbing towers well into the afternoon heat. We’re famished. Our driver, Visal, stops his tuk-tuk by a tourmada stall by the Bayon where a few Khmers sit on flimsy chairs and a woman directs us to her grill: charcoal burning in biscuit tins propped on stumps. Her fish is finished but she has pork skewers (bacon in cubes, really) and chicken: whole birds, splayed on sticks, $15. Or legs and pieces, $2 each. She serves us rice on red plastic plates. Then the chicken comes – grilled with crispy skin but not charred, greasy but not too much, dark meat and light meat. This was no fat, fleshy chicken. This chicken ran around. This chicken’s legs taste of muscle. You can tell. There is something in the consistency – a tautness, a stretchiness. It’s not just a mound of flesh. I think of the interviews I did years ago with villagers in Laos who told me: you want a chicken with legs that moved. A sedentary chicken is no good to eat, they said. She serves it with little dishes of tangy sauce – thinly sliced red onion/shallot in lime, fish sauce, sugar, big oblong cloves of garlic and chile. Yum. Eating grilled chicken near the Bayon. One morning, breakfast at the Shinta Mani…. The guava juice is such a luscious green, the color of a rice paddy in full growth. We linger over breakfast. There is a wide buffet of European pastries, congee, ham, cheese, salad, fruit, yogurt, cereal. Strong coffee. A menu of Asian noodles – pad thai, fried Chinese-style, kouey teau, nam banh chok. The description of the latter is so Eglish-ized I barely recognize it: Cambodian soft rice noodle in fish broth with mixed vegetable. But I’m delighted to see it’s the real thing; just needs a pinch of chile and dash of fish sauce. 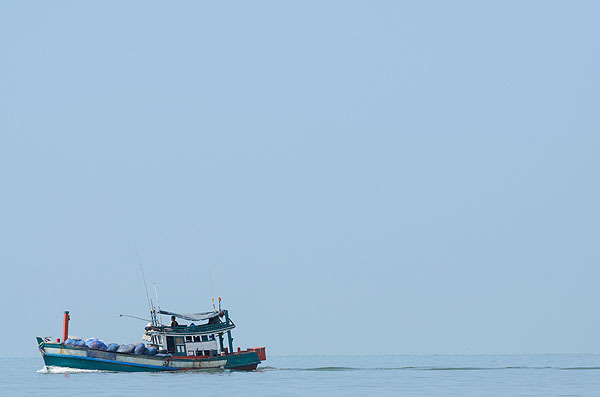 Heading to sea, near Kampot. 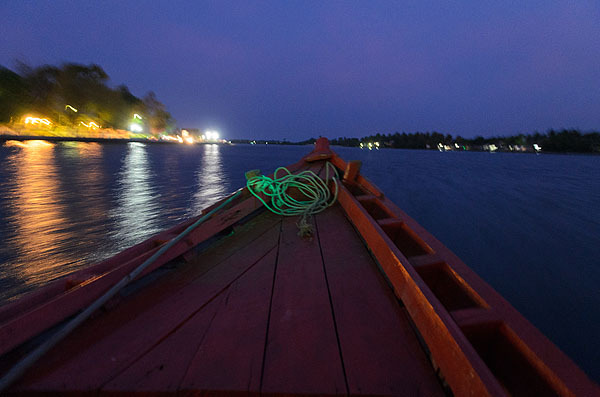 Searching one night for a seafood dinner…. We find a pink corner spot called Hong Hout. It has the menu I want and remember from years past: hole-in-the-wall Khmer restaurants with pages upon pages of everything from the land and sea. 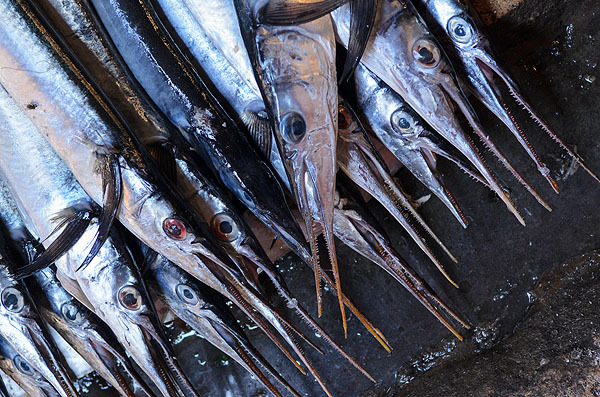 Hong Hout has it – a page each for shrimp and fish dishes, half a page of squid options. Dozens of soups, noodles and stir fries. 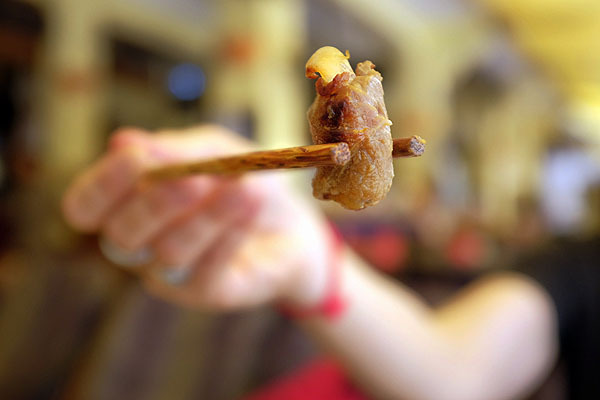 This goes way beyond the typical 10-item tourist menu with standard fried rice and noodles; basic pork, chicken and beef; maybe a shrimp, maybe a fish. 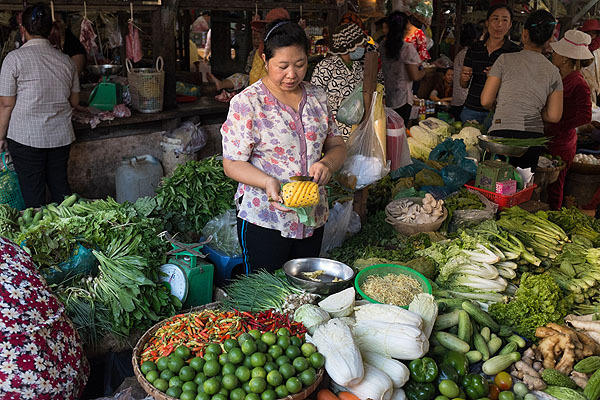 Those menus do not offer an array of sour soups and traditional curries, and seafood and fish with “ripe” and “unripe” pepper as we find here at Hong Hout. We order fish steamed with “lemon taste” and shrimp curry. The fish is large, a sea fish, with a cartoon-drawing rack of bones. The lemon is preserved – a tangy taste with a bit of soy. The shrimp are small, mixed with green Khmer kreung and lots of lemongrass in the flavor. Green pepper and onion, all on a plate. Rice. Hot jasmine tea. $6 total plus two free mangoes as sweet as the day is hot. Just don’t visit the bathroom. 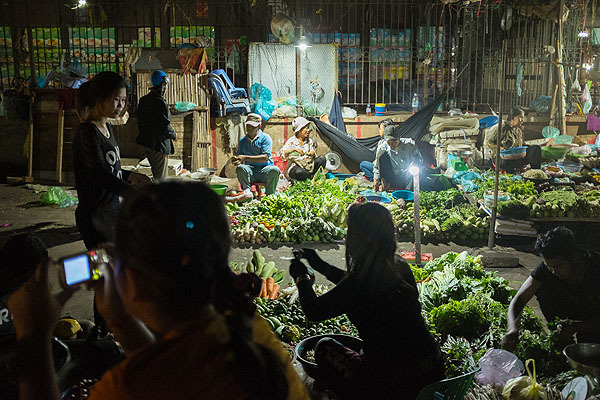 A vendor at the Kampot market carves a pineapple. We order many things, but this dish — this dish — sticks: Curried Indian chilled & pureed zucchini soup with goat cheese = what to do next with summer squash! I’m inspired. It’s creamy. It’s curried. It’s yellow. The standout: thin slices of eggplant in rice flour batter around minced pork with black beans, lots of thin sliced ginger strips, soup Knorr (could use fish sauce instead, I think), curry, green onion. A bartender shakes a tropical cocktail at Siem Reap’s Shinta Mani. Grilled pork wrapped around onion. Mouhot didn’t write a ton about what he ate. 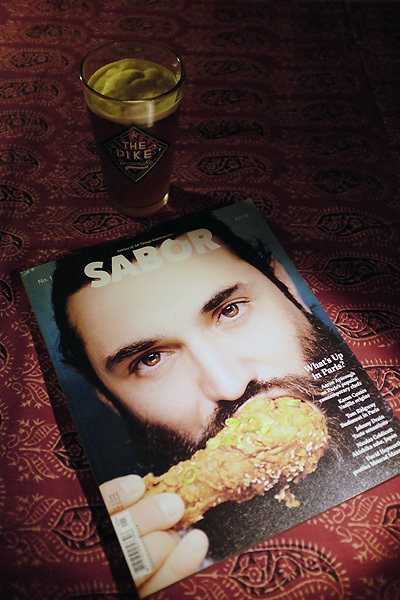 I hope, before he met his unfortunate end in Laos at the age of 35, he sampled and savored these flavors we have been so fortunate to eat. 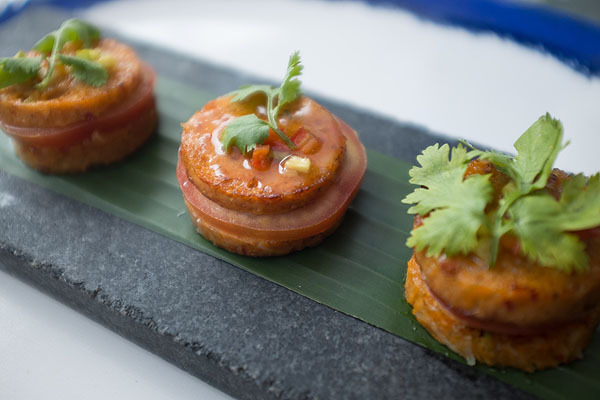 Traditional fish and rice cakes served with a modern flair at the Shinta Mani Resort. 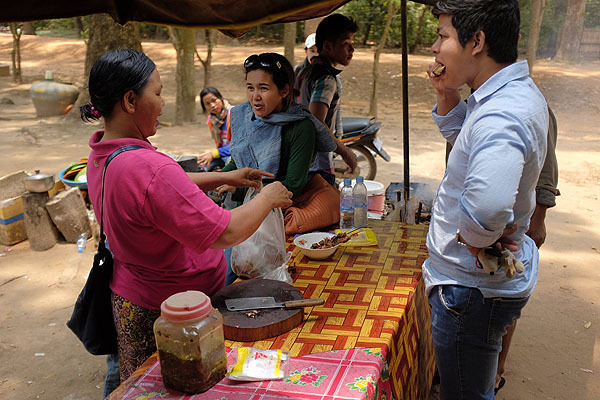 The influx of foreign tourists has brought an influx of foreign-friendly foods to the Angkor Archaeological Park. 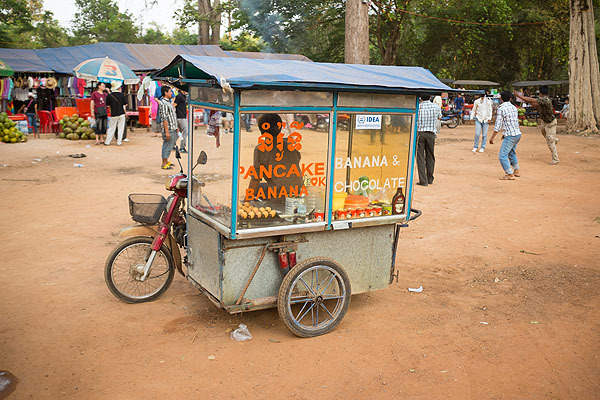 This banana-chocolate pancake cart is parked at the bottom of Phnom Bakheng, a popular sunset destination. Fish for sale, Kampot market.